The combination of a top quality alloy with outstanding corrosion resistance, an enhanced painting process and excellent impact protection, offers the longest lasting protection on the market yet over the combined effects of water, impact and corrosive environments. 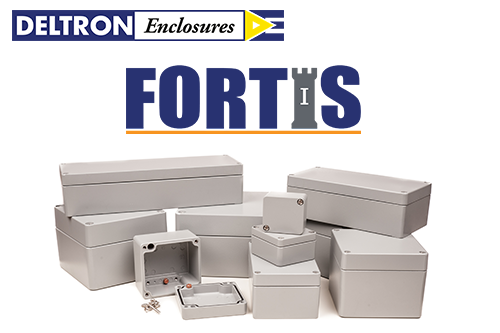 Tom Downing, Product Manager at Deltron Enclosures commented: “The Fortis range offer the same form and fit as the market leading thick wall cast aluminium enclosures but with extra durability and corrosion resistance due to the low copper content in the alloy. Galvanic effects between copper and aluminium increase the speed of corrosion, so a lower copper content leads to slower corrosion of the aluminium; this series contains less than 0.1% copper content, whilst most on the market contain between 3% and 4%. In addition to the improved alloy, a salt spray test simulated prolonged periods in a corrosive environment and although the enclosures are certified for resistance up to 1000 hours, the test actually went on a further 18 weeks before being stopped, and the box was still not corroded. Furthermore, all IP testing was carried out after impact testing to verify that the seal is maintained when the enclosure is treated roughly. The enclosures also boast reusable seals which will withstand up to 200 compressions or uses; many on the market are single use and not environmentally friendly. Multiple sizes are available with IP66 or IP68 ratings in grey, black or red. Datasheets and 3D CAD models can be downloaded from our website. 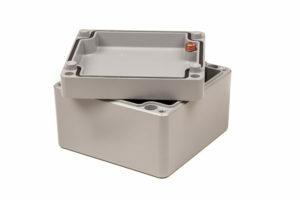 Deltron Enclosures is one of four brands of DEM Manufacturing; a division of Alpha 3 Manufacturing Ltd.